A new actor may be selected to portray the younger version of Batman portrayed in the next the Arkham game. Close your eyes and imagine that Batman is talking to you. If the voice you hear isn't Kevin Conroy's, then you're doing it wrong. 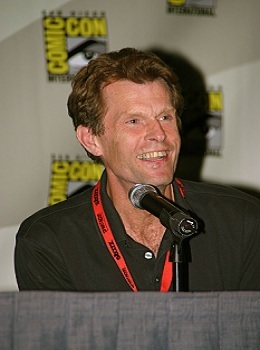 Conroy, who began voicing the role of the Dark Knight in the acclaimed Batman: The Animated Series, is, for many, the definitive voice of Bruce Wayne and Batman. Outside of the Animated Series he's been the man behind the character in shows, movies, and videogames including Batman Beyond, Superman/Batman: Public Enemies and Batman: Arkham Asylum and Arkham City. Whenever a new Batman project is announced, the first question on many a fan's mind is whether or not Conroy will be involved. Unfortunately for Batfans, it appears that the next game in the Arkham series will not be featuring the veteran voice actor. According to the latest issue of the South African publication NAG Magazine, Warner Bros. Games Montreal has chosen to pass on Conroy, opting instead for another, still to be announced, performer that it feels will better portray the younger, brasher Batman of Arkham Origins. Some were already grumbling when it was revealed that Rocksteady, the studio behind the first two Arkham games, wouldn't be at the helm of Arkham Origins and this latest move could potentially disappoint a lot of franchise fans. That said, the departure of Conroy wouldn't be unprecedented. Mark Hammil, famous for his various portrayals of the Joker (and some other obscure roles you probably haven't heard of), said, prior to the game's release, that he was finished with the character following Arkham City. In the end, it may just be important to remember that Conroy is not the only person that's ever voiced Batman, even if some might regard him as the best.